Play Dragon's Story at Leo Vegas! We all love dragons. We especially love them in the old fashioned Dragon vs. Knight tales of old but usually it's just a bit more fun seeing the knight getting cooked alive. No? Just us? Anyway, NextGen have created this new slot called A Dragon's Story and theme is just that — a story based around a dragon. Follow Ruff as he guards his precious gold from the nasty thief Sir William and you may get a little gold in return. It's a fun little game and utilises an effective superbet system that makes playability even more enjoyable. But what else does it have to offer? Read on to find out more! 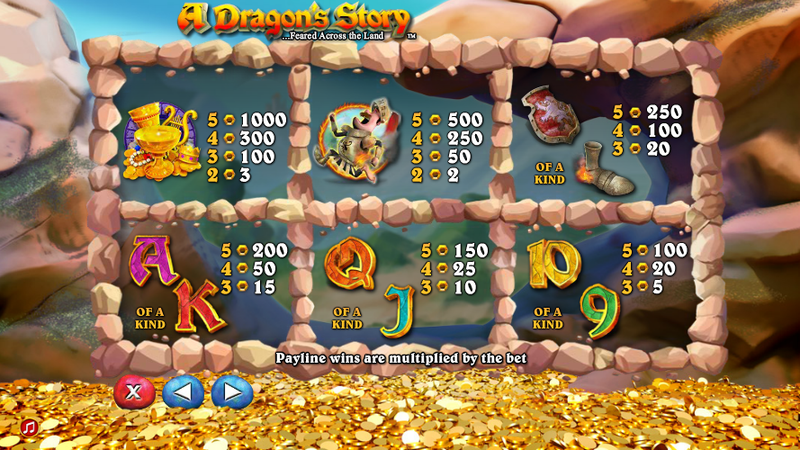 A Dragon's Story is your standard 5x3 reel slot with a colourful aesthetic and great music that matches the theme. What it makes effective use is 3D graphics and animation, which is fairly characteristic of NextGen. Like other games in their line-up, Dragon's Story delivers a memorable and creative design which further increases the strength of NextGen's brand of software development. The game has several bonuses which help the player to make a win, particularly a superbet feature and a bonus game which increases the RTP exponentially so players could see a return of up to £50,000! All while Ruff the Dragon breathes fire and helps you fend off Sir William. As mentioned, NextGen's unique selling point is its effective use of 3D graphics in otherwise 2D games, blending them seamlessly together, so that both background and characters match perfectly. Dragon's Story is no different and the dragon's design could have easily come off a lot worse than it has. Fortunately, because of the cartoon-like style, the smooth graphics perform extremely well. Far too many other companies try and fail to use this. Many of those games either end up treading into the uncanny valley of pixelated nightmares or become so glitchy that the game is unplayable. NextGen have struck this perfect balance flawlessly with graphics so smooth that it makes other software companies green with envy. We said earlier that this slot offers an interesting twist on the old knight slays dragon tale. Well, what about things from the dragon's perspective? Perhaps he was protecting his gold from greedy humans? This just goes to show the extent of NetGen's creativity when making new games. This title could have easily been cliche and trite in a market where so many such slots exist. It's refreshing to see things shaken up a bit. Saying that though, the slot itself is conventional enough to maintain familiarty with A, K, 9, 10, wild and bonus symbols a plenty. But the game also has little dragon minions that help Ruff in his mission to protect his precious treasure. Although this is far from a unique concept, it's still refreshing to see. There is plenty for players to sink their teeth into here. With as little as 25p per spin, a maximum of £50 can be gambled at one time with A Dragon's Story. This makes winning quite simple and with 25 playlines, you can be sure your win is pretty secure as players could win a jackpot of up to £50,000! Admittedly, this isn't the biggest jackpot around, but it's better than nothing and offers an enticing enough opportunity to want to play. And with a 95.618% return to player, that makes things better. Game Features: Superspin And Free Games! There are lots of features in A Dragon's Story for players to enjoy. Because of its unique retelling of the classic Knight vs Dragon tale, it does offer many opportunities for great features that players can exploit for their enjoyment and gains. Among them, you get chance to defeat the Brave Sir William on your own terms in the slot's mini-game and do much more besides! The Brave Sir William feature has to be the game's staple. Players shoot fireballs at Sir William as he tries to steal your treasure. The more treasure he drops, the more the player gets and if you successfully hit Sir William, you WIN BIG! You could even get up to 25 times your original stake and that's no exaggeration. The game can be triggered fairly often too if you collect enough jewel symbols on the reel. Players will have a blast (pun intended) while playing this bonus game and will be immensely rewarded for their efforts. The Free Games feature is triggered the same way as the Sir William feature. Collect three jewel scatter symbols or more anywhere on the reels and it will award you ten extra spins which will multiply any win you make by 2x. You can also re-trigger the feature and that gives you up to 20 extra spins in total. Unfortunately, the multiplier stays the same, but at least you have better chances of getting that big score! We wouldn't say that was a bad exchange. Let us hope it provides endless fun and heaps of rewards for our readers. Want to play Dragon's Story? 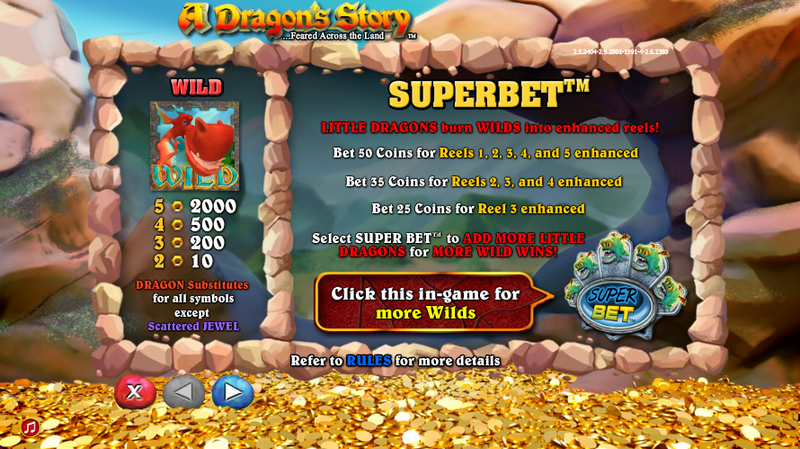 Dragon's Story has huge potential for massive wins, offers free games and superbets too! Claim the welcome bonus now! Dragon's Story Overall, A Dragon's Story makes for a thrilling game with bonus features that will keep you occupied for hours, it does a great job in getting players involved in its story with its multiple features. Where it lacks, however, is in its rewards. Players would have to win a multitude of times in order to gain anything largely significant (and thankfully you will be doing that). However, considering lesser games have a higher RTP and a maximum win, it's surprising that this game only dishes out £50,000 at best. Then again, the game's enjoyment factor is so high that it hardly matters. So we strongly recommend you play this game and have fun!